‘Find your place on the Planet. Dig in and take responsibility from there’. The Earth Day, an annual event held on April 22, was celebrated at DPS, Sector 84, Gurugram, as an ‘Environment Week’ from 16th April ’18 to 20th April ’18, simply with the aim of sensitizing the students about Environmental degradation. The idea was also to connect them to nature and implore them to get outdoors and experience their surroundings, to appreciate the beauty of nature and its importance, and to take forward the plea to protect the Earth that we share. Students from Nursery to Grade VIII enjoyed numerous activities held for an entire week focusing on environmental issues. Nursery and K.G students were engaged in an array of activities like Making Earth lockets & Earth hangouts, Tearing & Pasting Activity on tree cutouts, making of paper bags as a takeaway, making a Grass crown, Germination of seed in earthen pots, Nature Walk and reflection in their art files, discussion on Pollution – land, air and water, paper crushed ball to show Earth, Story narration -ek chhota beej with props. Students of Grade I made paper bags using old newspapers, magazine pages, etc. to make attractive bags of all shapes and sizes. The strings were made out of jute and coir and dry leaves and flowers were used for decoration. A Collage and Poster Making Activity done by Grade II and Grade IV students depicted various methods to save our environment. Grade II also very enthusiastically participated in planting saplings in the school premises with the belief that every tree/plant that grows will take us towards a greener and cleaner Earth. Grade III was engaged in making bird feeders of different sizes and shapes. It was an incredible way to get a closer look at birds. Grade IV had Interhouse Hindi Poem Recitation Competition. Students came up with original ideas and props and recited the poems with impressive voice modulation and expression. A Card Making Activity was conducted by Grade IV and V. They made very impressive handmade cards with eco-friendly decorative materials like handmade paper, ribbons, dried leaves and flowers, glitter and buttons. Special Assembly was conducted on the occasion of Earth Day, by the students of Class-V B to demonstrate the support and concern for Environmental protection. 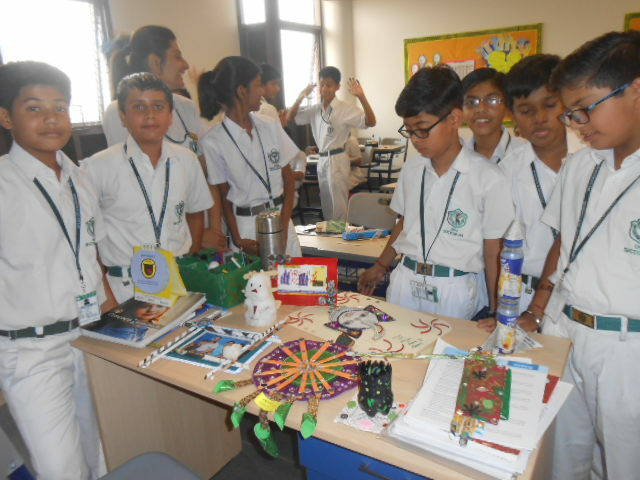 Students of Grades VI, VII and VIII reused the waste material and created awesome and beautiful ‘Best out of waste material’ objects like pen stands and planters, paper doll, organizer and lamp shade, pocket diary, etc. They made their environmental message memorable by picking a slogan that focused on the issue they care about the most. Some wrote about keeping the earth clean and safe while others were fascinated with issues like water, afforestation, sustainable development, etc. They also created attractive badges to distribute the same among the people during their awareness drive. An inter-house English debate competition was organized on 19th April 2018 for the students of Grade VI, VII and VIII. The topic for the debate, “Humans have been able to dominate the Earth/nature,” captivated the young minds and brought forth some very interesting perspectives from the debaters. Awareness drive to Town Square market was organized for students of Grade III to VIII. The main purpose of the activity was to create awareness amongst the people about protecting and conserving our environment and adapting the methods to use resources judiciously. Students had a chance to interact with vendors and the crowd in the market area and promoted sustainability of the environment by shouting slogans, distributing badges and hand bands. They also performed a street play on the said topic. They were also engaged in making handmade paper through a very simple process. It was a fantastic way to recycle old paper and make it useful by creating handmade paper. Our Principal, Ms Neelu Sharma, motivated and enriched the young minds about making simple modifications in our everyday life and contribute to the cause of environment protection.